Great first bike for a child that loves “Blaze”! 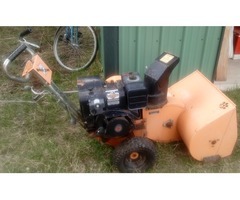 Bobcat Snowblower - Briggs and Stratton 4 cycle engine Needs new tubes for tires. 19/20” KONA Cinder Cone mountain bike. 26" wheels. Excellent condition. Only 3 seasons of use. Sandpoint location (off S. Lincoln). Come check it out.